Bulk Boardroom Planning Pads, 8.5''x11'', 4x4 Graph Rule, No Margin, 80 Sheets: Roaring Spring 95289 (12 Graph Planning Pads) by Roaring Spring at LDP Graphic Design. MPN: 95289. Hurry! Limited time offer. Offer valid only while supplies last. 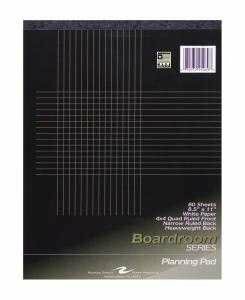 Bulk Boardroom Planning Pads, 8.5''x11'', 4x4 Graph Rule, No Margin, 80 Sheets: Roaring Spring 95289 (12 Graph Planning Pads) Boardroom planning pads. Bulk Boardroom Planning Pads, 8.5"x11", 4x4 Graph Rule, No Margin, 80 Sheets: Roaring Spring 95289 (12 Graph Planning Pads) Boardroom planning pads. Graph on one side and narrow lines on the other side. Use this ruled pad for project plans, sketches and much more. The premium, white 20# writing paper is printed with 4 square/inch graph lines on the front of the sheet, and has narrow (1/4) ruled lines on the back of the sheet. The covers are a printed white board, and the backs produced with an extra-heavy 80 pt chipboard, allowing lap and clipboard style usage. Each pad is glued and taped along he 8.5'' side. Size is 8.5'' x 11'', and there are 80 sheets per pad. Proudly made in the USA. Bulk Boardroom Planning Pads, 8.5"x11", 4x4 Graph Rule, No Margin, 80 Sheets: Roaring Spring 95289. Graph on one side and narrow lines on the other side. Use this ruled pad for project plans, sketches and much more.